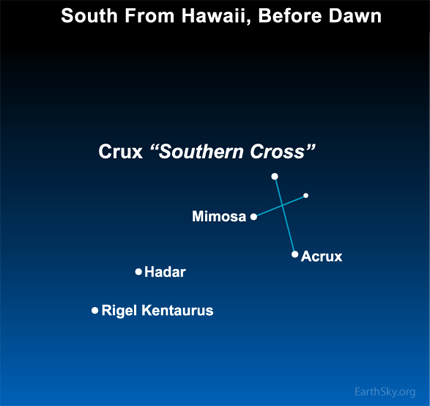 A reader asked us, “When can I see the Southern Cross in Hawaii?” At this time of year, Hawaiians can see the Southern Cross, which is also known as the constellation Crux, in the southern sky before dawn. The Southern Cross stands close to upright, but quite low in the sky. Notice the two nearby stars, Rigel Kentaurus and Hadar. Rigel Kentaurus is more commonly known as the alpha star in the constellation Centaurus. This famous triple star, Alpha Centauri, is the nearest star to our sun at a little more than four light-years away! There is one surefire way to know if the Southern Cross is visible in your sky or not. When the M or W-shaped constellation Cassiopeia the Queen is out in the sky, the Southern Cross is below the horizon. Although Cassiopeia lights up Hawaiian skies on winter evenings, it sets beneath Hawaii’s northern horizon several hours before sunrise. As Cassiopeia sets, the Southern Cross rises. For all but the southernmost parts of the United States, Cassiopeia never sets. 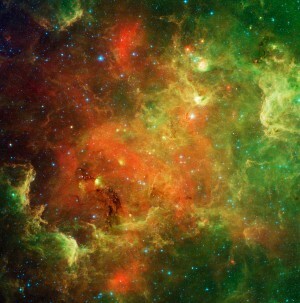 Therefore, the Southern Cross never rises. This U.S. Naval Observatory page tells you the rise/set times for the stars Mimosa, Hadar and Rigel Kentaurus. What is the bright object up before dawn in December?